There's been much to celebrate in the world of Boatrocker in the first half of 2015. The Braeside brewery took out the Champion Small Australian Brewery at the Australian International Beer Awards a few weeks after sweeping the People's Choice for the third time at the Good Beer Week Gala Showcase. Boatrocker also celebrated investment from Made By HAND, the business run by several of the men formerly involved in Little World Beverages (Little Creatures), which has been used to accelerate the development of a barrel room and bar. The latest venture is the launch of a second brand of sorts. The mutual friend that brought Boatrocker and Made By HAND together was Boatrocker co-owner Matt Houghton's home brewing buddy Brett Matthews and it's Brett who's behind the concept for "Big Love", the new home for the more approachable end of the brewery's range. 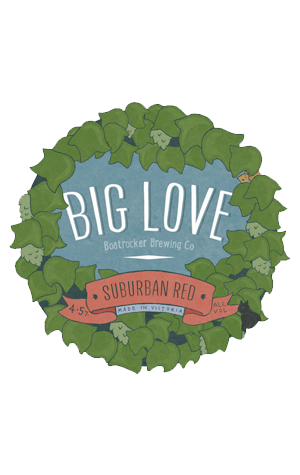 The first two beers to appear under the Big Love moniker – and standout tap handles by Rain Gidley – are the Smash – rebranded as Suburban Pale – and this Suburban Red. Based on one of Brett's recipes then tweaked with the two brewer Matts at the brewery, it's inspired by malty bitters from the UK, punchy American ambers and the smooth altbiers of Dusseldorf. According to the brewers: "We begin with ale and Munich malts as the base and build in layers of flavour using speciality malts from the UK, Belgium and Germany. Hops hail from the US, the yeast strain from the UK and water from the green rolling hills of Braeside." The result is "moderately bitter with a gentle hop flavour and aroma and moreish, biscuity, wheaty malt."